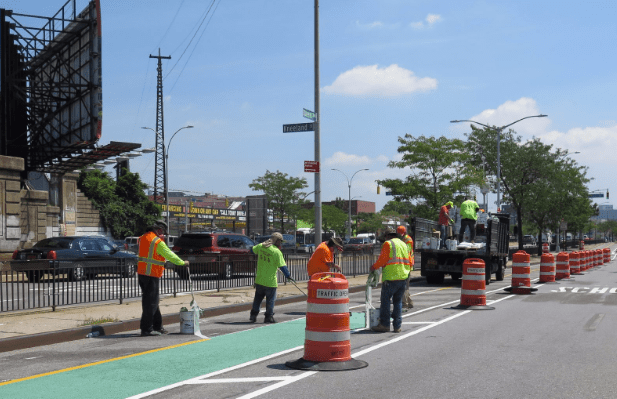 Green paint is down on a new section of the Queens Boulevard bike lane in Elmhurst. The second phase of the Queens Boulevard redesign runs from 74th Street to Eliot Avenue [PDF], extending east from phase one, which was implemented in Woodside last year. After construction wraps up this summer, there will be 2.5 miles of continuous median-aligned bike lanes on the most important east-west route in Queens. In addition to the bike lane, the project calms car traffic and creates safer walking conditions. Below is a new crosswalk at a stop-controlled transition from the center roadway to the service road at Cornish Avenue. Previously, the design enabled drivers to merge quickly, without stopping. The project is still a work in progress. Still to come, among other things, are plastic posts to separate the bike lane from motor vehicle traffic. Phase 3 will extend improvements to Rego Park and Forest Hills next year. In 2018, the city will begin to build out these changes in concrete. Flex delineator should help with that when they go in. Any insight into why flex and not something more substantial? No specific insight. Maybe, with plans to build out in concrete as a raised bike path in 2018, DOT wants to keep cost of install install down? Also either Qwick Kurb bollards or Jersey barriers, while providing more protection, would be less permeable to bikers entering and exiting the bike lane to access side streets, perhaps DOT was concerned with that? Seeing the annoying Eastern Parkway concrete news, nice to see this continued progress. Safe streets for all users! This is wonderful. 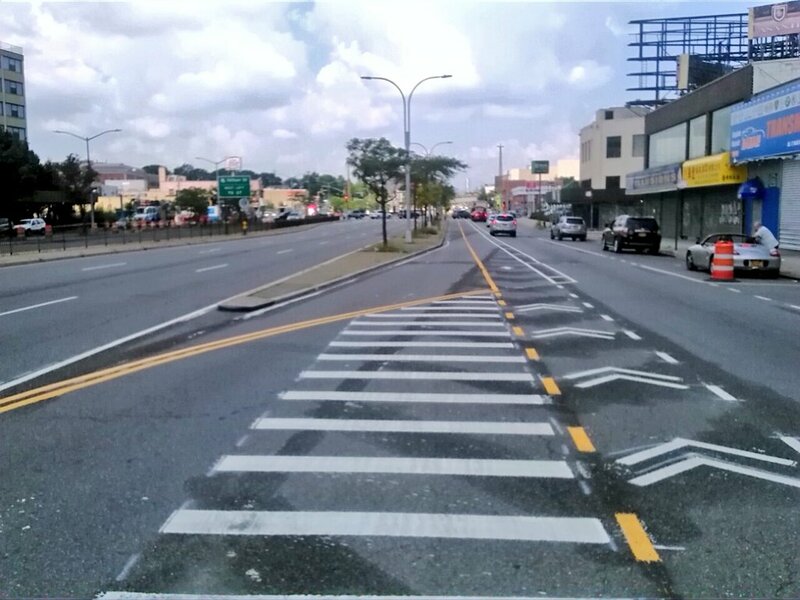 When you include the bike lanes parallel to Queens Boulevard on 43rd and Skillman Avenues, we now have an all-bike-lane route from Manhattan all the way to Woodhaven Boulevard. The problem is that bicyclists don’t stop at this light. Every time I am stopped there, I see other bicyclists just zooming through, not even slowing down. This is a spot where cyclists’ unfortunate default inclination to blow lights could really have some tragic consequences. I don’t say this lightly: I am afraid that someone is going to get killed there. Anyway, each cyclist will decide whether or not to follow the the rules. When used correctly, this bike lane changes the nature of riding in Queens. Do they have sensors on that light so it only goes red if cars are actually crossing the bike lane? If not, that’s your answer as to why cyclists aren’t stopping there. It’s a stupid place to put a traffic light to start with (i.e. cars going to the service road should yield to bikes in the bike lane at all times). It’s doubly stupid if it goes red when there’s no reason for cyclists to stop because nothing is crossing. When traffic controls are overused or misapplied, this tends to dilute their meaning. As a result, users treat them more casually. It’s a virtual guarantee cyclists will ignore most red lights if you use them as frequently as NYC does. The much higher compliance rates you see in places like the Netherlands aren’t because the cyclists there are saints. Rather, it’s because traffic signals are used only where appropriate. As such, a cyclist knows they’re in real danger if they ignore it. NYC often uses traffic signals or stop signs as speed control devices. They also almost never have traffic signals on sensors. Have lights which only go red when something is actually crossing and most cyclists will in fact obey them, if for no other reason than self-interest. There are two problems here. First, When the traffic signal at 65th Pl is green for cars eastbound on QB, there is VERY HEAVY car traffic using this exit lane -from the main road to the service road–this is the ONLY way to get from the eastbound main road onto the BQE, so there is a much heavier use of this exit than the others that just exit to the service lane; this is why DOT established that there needed to be a signal here, rather than the stop signs used at the other exit ramps, where, indeed, cars are obliged to stop & yield to bikes in the bike lane. However, after the QB light changes to red, the bike signal STAYS red, even though there are no more cars using the exit lane. That is an error of DOT’s, and incentivizes cyclists to run the red bike signal. However, after the QB light changes to red, the bike signal STAYS red, even though there are no more cars using the exit lane. Regarding your first point, about the necessity of a light at that location: the volume of traffic that you mention crossing from the centre roadway to the service road is highly variable during the day. I have been there at night when no cars crossed during the entire red period for bikes. This induces cyclists to blow the light. The problem at that time of day is that any one individual driver, seeing that he/she has the light, just goes into that exit at speed. If/when the tragedy occurs, it will not be during periods of high volume when the need for cyclists to stop is obvious and is forced by the mass of automobiles; it will be during the nighttime hours when a cyclist who assumes that he/she can ride right through is hit by a driver who is given the right of way by the signal. It seems to me that there are two possible solutions. First, the signal can be timed differently at different times of day, giving drivers coming from the centre roadway a long period during most of the day but alternating more frequently at night. The other possible solution is to put up better signs, perhaps a big sign saying “DANGER: BICYCLISTS MUST STOP AT RED”. If something is not done, we’re going to be sorry; and it will screw up the whole Queens Boulevard project which is based on reclaiming the “Boulevard of Death”. There is a third solution. At night the light goes flashing red (indicating stop) for the service road exit and green for cyclists all the time. Cyclists always have the right-of-way and vehicles going to the BQE won’t hit the exit at speed because of the flashing red. Or you could use sensors. The service road exit remains red (and the bike lane light remains green) until a sensor detects a vehicle trying to use it. At the point the bike lane light goes red long enough for the vehicle to go, then changes back to green immediately after. Long term when we build out the bike lane permanently I would like to see the bike lane put on an overpass so cyclists can avoid potential problems altogether. This will also avoid delaying cars exiting the main road (and hence will get support from drivers who might otherwise complain about the cost). I checked. After the green light for eastbound traffic on QB at 69th Place turns red, the bikes-only signal at the e/b (BQE) exit from the main road to the service road remains red for 15 seconds. It would probably be reasonable for the bike signal to stay red for about 5 seconds, to allow a car on the main road that enters the 69th Pl intersection after it’s turned yellow to get thru the exit lane to the service road. Leaving the bike signal red for a full 15 seconds is just nuts. Any car that’s that pokey can damn well just wait for the bikes to pass. (And there wouldn’t be a queuing problem–there couldn’t imaginably be more than one.) Even I–the bike rider in NY who stops for red lights (you knew there had to be one)–jump the signal there (after making sure there are no cars in the lane). Yeah, but this only exists because Mayor DeBlasio and Council Member Dromm overruled CB4, which hates all things bicycle-related. Boro Pres Katz attacked the Mayor for overruling the Community Board. I fear what may happen if the Mayor is not re-elected. We were talking about two different things here. When I said “I don’t remember seeing both lights red at the same time”, I was referring to the bike signal at 65th Street and the signal governing cars coming from the main road to the service road at 65th Street. I am pretty sure that those are never red at the same time. I didn’t catch that, when you said “after the QB light changes to red, the bike signal STAYS red”, you were referring by “the QB light” to the light a little farther east, at the corner of Queens Boulevard and 65th Place, not to the light regulating the cars entering the service road at 65th Street. Sorry for having added some confusion. Anyway, now that I understand what you are saying, I can agree that the bike signal stays red for far too long. I hope the DOT does something about this. Now is the time to address it, while the whole thing is still new. At night the light goes flashing red (indicating stop) for the service road exit and green for cyclists all the time. Cyclists always have the right-of-way and vehicles going to the BQE won’t hit the exit at speed because of the flashing red. Is the geometry of the intersection setup for that to be safe? Don’t motor vehicles face a tighter turn at stop sign controlled crossings of the bike lane? The sensor you mentioned sounds safer. But off peak what share of people do you think are on bikes, and what share in cars? You’ve mentioned cases where if cyclists are the majority that pedestrians should yield to them. Does that apply when to drivers as well, and should the signal be setup to default to a red for the higher traffic lane? If I were you I wouldn’t hold my breath on any grade separation. It’s not a tight turn for cars. It’s just a veering right. If the link works right (I hope so; I am on my phone), we see this shot looking east on Queens Boulevard at the light in question. In the photo we can see that the bike signal is red, and the signal regulating the cars exiting from the main road is yellow (so just about to go red). I kept writing “65th Place,” when I should have written “61st Street.” Simply a brain glitch on my part. The main traffic signal I mean is the one at 61st St. The bikes-only signal is on the eastbound service road just east of 61st St (opposite the liquor store). It does stay red for 15 seconds after the main traffic signal at QB & 61st St has gone red for eastbound auto traffic. I apologize for the confusion my error has caused.